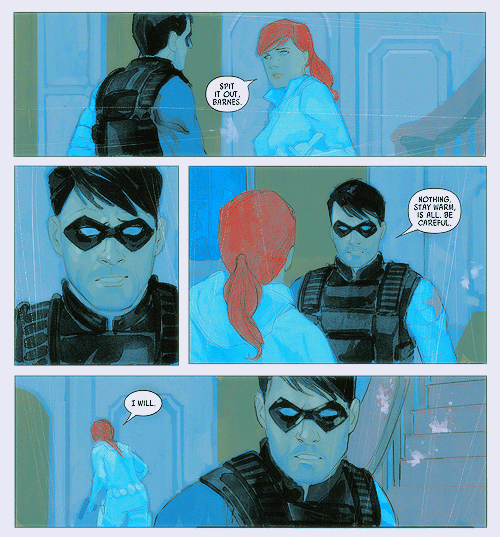 This is a loose summary of Nathan Edmondson & Phil Noto’s Black Widow #8-15, done for #buckynat week and fuckyeahbuckynatasha. First, some groundwork: he ongoing Black Widow series is collected in six-issue TPBs, but it doesn’t fall quite as neatly into six issue arcs. The storytelling engine is introduced in issue #1: Natasha starts taking independent espionage jobs, in order to settle literal and metaphoric debts. While the first few missions take one issue each, complications develop and one story overflows into the next. Bucky appears in #8, #12 (briefly), and #14, each appearance borrowing meaning from the place it has in the wider narrative. 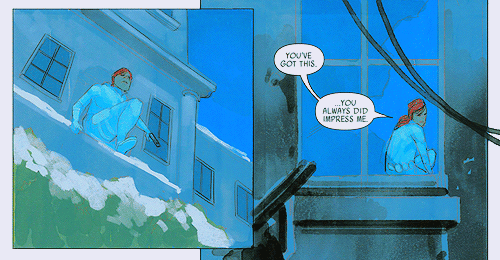 So in Black Widow we see Natasha’s “days off”, but also the small and larger labors of making good, being good. It is also very concerned with Natasha’s loneliness. While the last Black Widow ongoing began during the Heroic Age, with Natasha in a strong, pre-established relationship, by the time this book kicks off, the Avengers are spinning slowly towards extinction and one of the great loves of her life stolen from her by an evil wannabe mastermind and also bad plot twists. We shouldn’t be surprised Natasha begins in a lonelier place. The book doesn’t address the specific shapes of Natasha’s lost memories, focusing more on the things Natasha has done and not the things done to her. But, though the story is told largely from her POV, it still makes use of the meanings that came before. Black Rose: I hear things about you, Natasha. Things I would not have imagined, all those years ago. You have friends now. I am happy for that. And scared for you as well. In The Name of the Rose, after escaping from the hospital, Natasha says to herself, “I should have known this would happen. But I got happy, and soft.” Black Rose tells her one issue earlier, “You have friends now. I am happy for that. And scared for you as well.” Spycraft is lonely work, inherently alienating. And as Natasha turns back to spycraft, ostensibly to help others, refusing money for herself, she is nonetheless drawn back to solitude. The legend goes that in Ancient Sparta, soldiers were told to love each other, that they would fight more bravely for their shieldmates. This is what Natasha’s comic book Soviet masters believed too, except they always meant to widow her. They arranged a relationship between Natasha and Alexei and then arranged for it to end, so that Natasha, a hard-loving person, could fight for a hole in her heart. To control her, and to christen her, they had to make her lonely. This is why her relationship with Winter Soldier was so dangerous, why it had to be undermined. 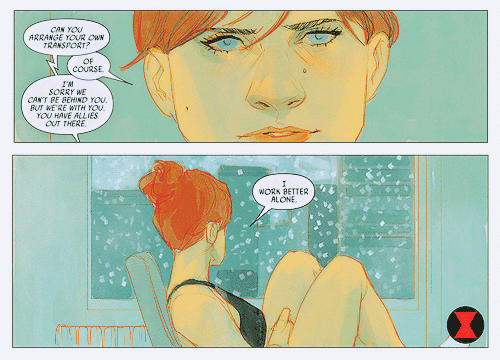 Edmondson and Noto’s Black Widow begins with Natasha alone, then spins outward. In the first six issues we are introduced to the little world the book builds for itself, to Isaiah Ross, Ana the neighbor, and Liho the cat and Maria Hill, Natasha’s principle SHIELD contact. Then the book spins into the wider curves of the Marvel Universe, and then even further into time travelling future universal wtf-ery and I am not even sure what is going on there yet. Different superhero figures come to represent different aspects of Natasha’s life, her connections. Daredevil, in issue #7, embodies the self-righteousness of the superhero community. Clint, in a recurring role, represents her connection to the Avengers and her advocate there, and the possibility that her past mistakes can be made good. Tony gets called a philanthrobot. Despite the gripping solitudes of her profession, Natasha in fact makes connections everywhere she goes, means something to everyone she meets: she is exceptional. Bucky, I think, in this matrix of superhero relationships, represents his own category. While Matt Murdock can’t see Natasha in the shadows she’s slowly returning too, Bucky Barnes already lives there. In fact, when they meet, it’s because they catch each other on a mission. Occasionally… a client hires me to recover something they’ve lost. Or something that was stolen from them. 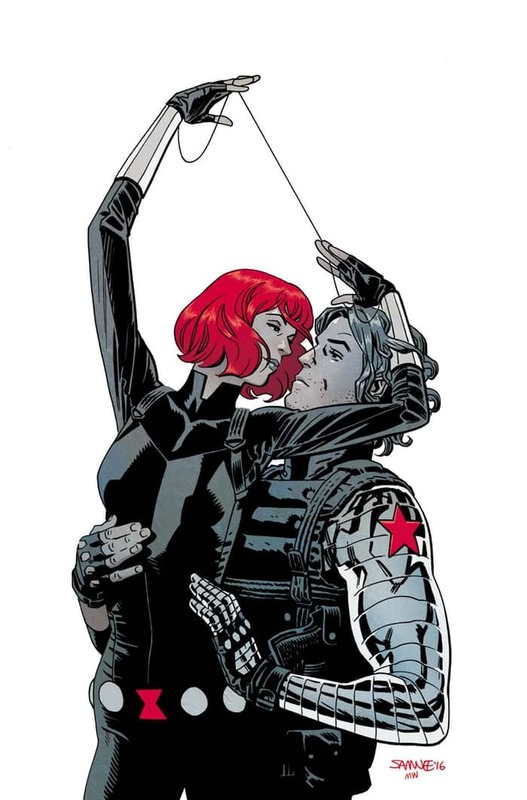 Over the years, the Winter Soldier, James “Bucky” Barnes, has been Black Widow’s comrade, enemy, fellow Avenger and one of the great loves of her life. But ever since a madman messed with her mind, she doesn’t remember the relationship. He does. Bucky doesn’t parachute in expecting to meet Natasha, I don’t think, but because he’s trying to stop the bad guys that inevitably show up to complicate things and make this a team up. “Nat— Black Widow?” he says, seeing her again for the first time. But even with the missing pieces, it’s clear that the two of them work well together. There’s a deliberate sexual tension between them, unresolved because of the circumstance, but not erased by it. They were never together because of the brainwashing. So they flirt and shoot bad guys. Natasha: Stories of my failures, no doubt. They run around on the tops of trains and seek shelter in a nearby house, abandoned for the winter. The scenario is basic, but allows for moments of nearness. It’s all supposed to feel easy and familiar. Natasha even smiles— small, but more than once. The way Noto paints them, the moments fit together like snapshots. It’s so natural that Bucky almost thinks she might remember him after all. He tries to say something, but the words never get their chance. Natasha: Spit it out, Barnes. Bucky: Nothing. Stay warm, is all. Be careful. Natasha no longer knows to call him James. Bucky looks like he’s been stabbed. Later, he runs out into the white cold and enemy fire, like an idiot, like he does, and jumps on top of a plane with death in his eyes. 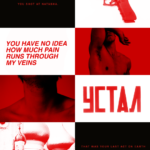 “You shot at Natasha,” he says. “That was your last act on earth, pal.” Maybe the Spartans knew what they were talking about. Maybe the Red Room did too. Presumably after this, Bucky returns to the all-mothering void to become Space Bucky, or something. Stay warm. I want to call attention here to the metaphor of winter. The title of this issue is Bitter Cold, and both of them are dressed to match a blizzard, whites over black. 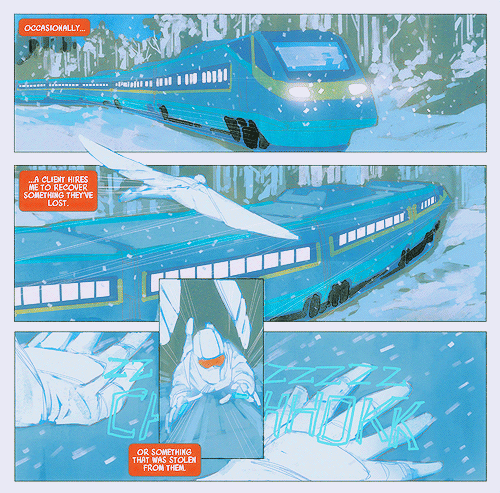 The snow is an the obvious visual reference to Bucky’s codename— he is the Winter Soldier— and Karpov’s line in Captain America #5. “We Russians… we have nothing but our winter.” Bucky and Natasha discuss the seasons while they regroup briefly in a vacant house, before they both return to the cold. Bucky: I’m guessing the residents are somewhere warm for the summer. Natasha: I’ve never understood that compulsion. Bucky: Neither have I. Clear night skies, cold mornings… it must make New York feel so far from home for you. Natasha: It gets cold enough there. In spy fiction, “the cold” is another name for the isolation of espionage. If we are going to borrow another line from the series— “home is where the hurt is"— then they’ve both made their home out there in the frost. Existing, like her, Bucky doesn’t scold Natasha, or need to know what she is up to. She can lend him ammo. That’s why everything is so easy, because they stand in the same blizzards. Maria: Can you arrange your own transport? Maria: I’m sorry we can’t be behind you. But we’re with you. You have allies out there. Natasha: I work better alone. Noto uses different line and coloring techniques to set different moods for his story. In these panels his coloring is soft, the lines are thin and sketchy. It gives Natasha a vulnerability she doesn’t necessarily posess in the rest of this issue, even though this is the end, when she is finally safe and inside. It’s not true what she says to Maria, staring out at the snowfall, but she does what she has to to keep herself warm. The next time we see Bucky is during the Anderson Cooper Special Report Issue, where the CNN silver fox reveals on national TV all the shadows Natasha has been lurking in. He doesn’t tell an untruth, and he is not unfair, but the broadcast is still a turning point in the series, forcing Natasha further and further away from her friends and contacts. Neither the Avengers or SHIELD can acknowledge her, reporters are searching for her, and Natasha has to be less of a person than usual. 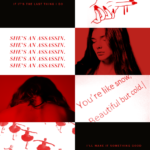 Natasha: The world is a nasty, complicated place full of riddles and shadows. Chaos lives up to its name, it’s wreaked havoc on my life, it’s made everything miserable. There’s no defense against pure chaos. There’s nothing for it, except to slowly turn up the light on its shadows. Facts are few, friends are fewer… and rarely worth the effort. As with so many things about Natasha, this is the truth and the lie together. Natasha doesn’t fit in to the Avengers or SHIELD; she has decided to be the exception to both of their categories. She’s always, I would argue, thought of herself as above the rules, or beyond them. That instinct was what allowed her to defect, to tell her heart yes but her mission no, to do missions money but not keep it, to do better, and not just survive. Natasha: How long have you been watching me, and where from? Bucky: From… far away. And I have kept an eye on you since Prague. Natasha: Why? Why me? I don’t believe in two coincidences. Bucky, free from the politics of SHIELD and the Avengers, and with his own resources, is the first one to come to her in person. The actual team-up this time isn’t much, since Natasha is intent on rushing straight-on into danger. But it’s revealing none the less. First, there’s the fact that Bucky has been watching her. Some people consider this creepy, and it is, a little, but all of her friends are watching her. Natasha is a spy and understands that her privacy will be taken if she does not protect it. She expects her movements to be tracked and tracks the movements of others. Some people (okay, one guy on CBR) have said that it doesn’t make sense for Bucky to show up here, now that he’s become Space Bucky. 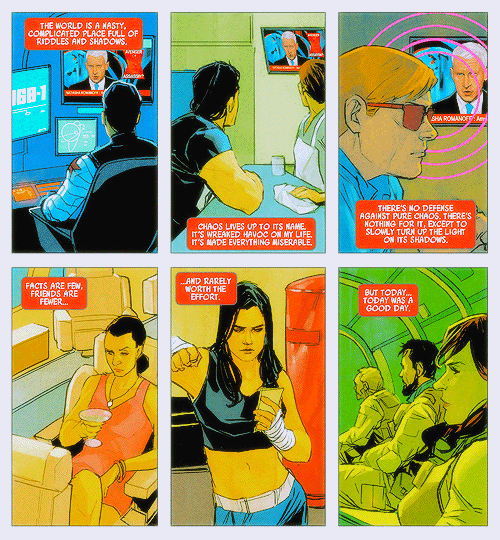 But I don’t buy that, either— Invaders shows him keeping tabs on Steve and his old war buddies, even worlds away. If he has some relationships deeper than what status quos dictate, then, well, so what? Bucky is exceptional too. You’ve got this. …You always did impress me. 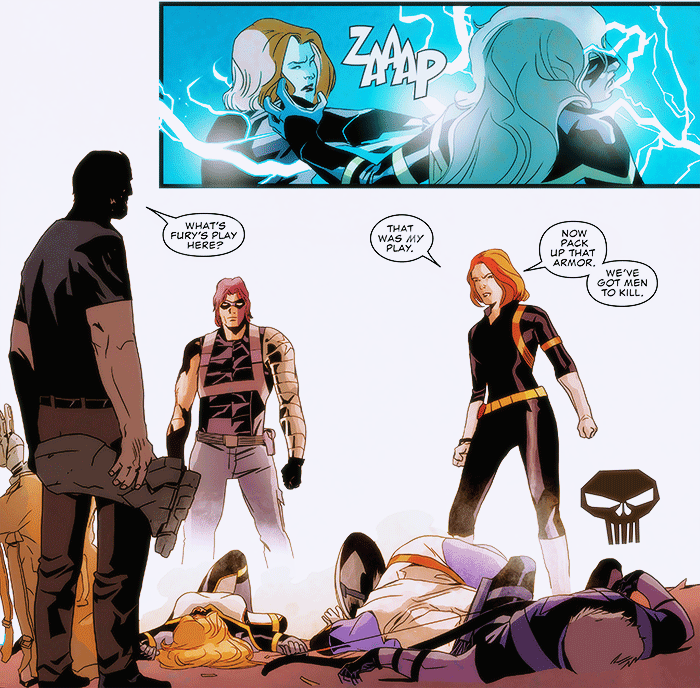 There are a lot of moments in these Black Widow issues that call back to previous stories, except this time Natasha is playing Bucky’s part. The line above.overflwoing the panel grid, echoes “she always amazes me” line in Winter Soldier #1, but it comes from her lips and not his greyboxed inner monologue. 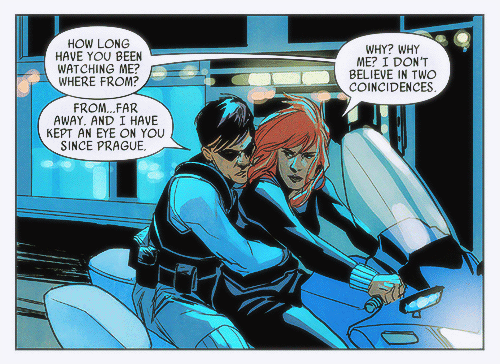 They ride a motorcycle together, just like they used to, but now Natasha is the one who is driving. Natasha’s past midseeds are broadcast to the world via supervillain meddling, just as in the No Escape arc of Captain America. Natasha runs headfirst into danger, now, and Bucky has to catch her. Even the cover of Black Widow #8 positions them as two parts of the same person. 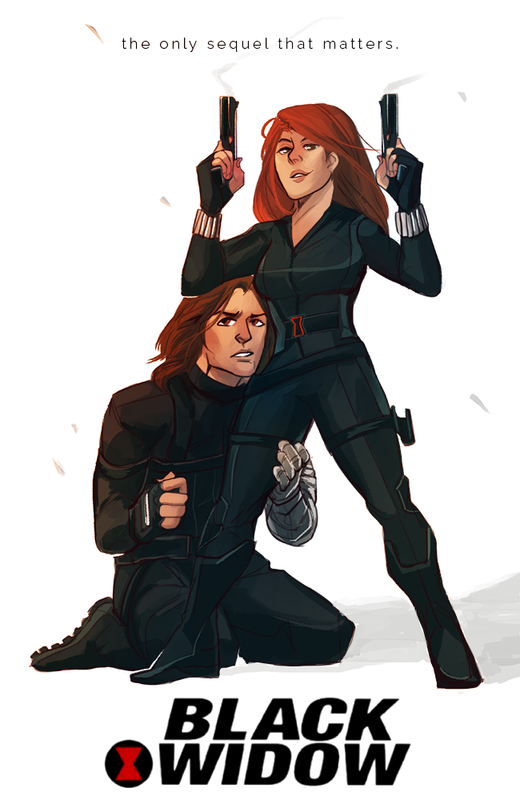 I want to put the lie to the idea that Natasha was ever Bucky’s simpler, stronger half. She is not his perfectly crafted, perfectly supportive girlfriend. She does— did— try to support him, not because of the clarity of her compassion, but because she knows what the cold feels like, and how you can learn to make your home there. Bucky: I know you don’t need me. But please, Natasha. Whatever else we are… let me be your friend. Natasha: You’re a good man. Bucky: Not really, no. But you’re the only one who understands that. Consider: this scene doesn’t work if Natasha doesn’t harbor her own cruelties, if she doesn’t carry her own secrets inside her. She has had to learn some lessons so hard she has learned them over again. And that is what she could impart to Bucky, and why he is doing his level best to help her, now. 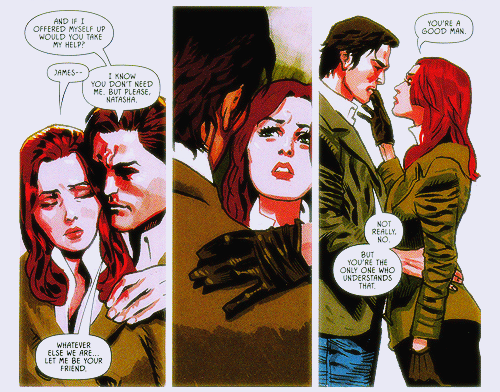 When asked about romance in Black Widow, Nathan Edmondson responded: “We early on — our whole team — decided we didn’t want this to be an oversexualized portrayal of the character and we didn’t want Natasha to be defined by who she slept with or what men were in her life.” Certainly the story that has played out is more about why Natasha isn’t with anyone: the distances and depths of the cold. 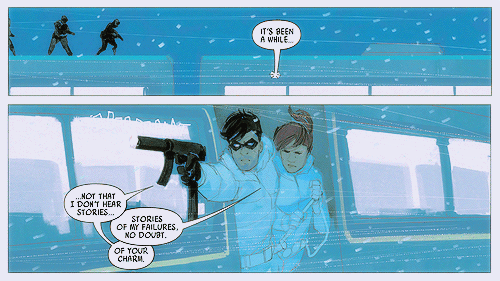 Edmondson goes onto mention the “fleeting” romance of Black Widow #8 as important to the story, worked in. Natasha is not loveless, then, only isolated. It’s a lonely, lethal world out there. To get through it, she— and he, and they— need to be the exceptions. Panels from issues #8, 12, and 15 of the current Black Widow volume, and issues #1 and 4 of the previous. Sure. 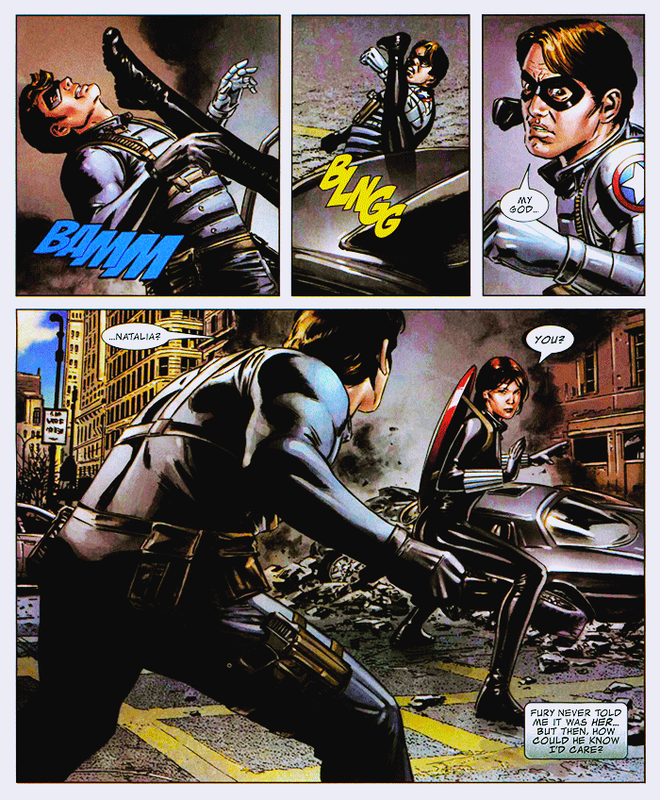 Most of their relationship is developed in Brubaker’s immense Captain America run. I usually recommend starting that book at the beginning (that is, Captain America v5 #1), but Natasha first appears in issue #27, and issue #25 is a decent starting point. I don’t do the pirate thing on this site, but there’s a buy-one-get-one thing going on at the Marvel store right now, so half of these comics can be free if you act quick. 1 Available digitally as single issues: #616, #617, #618, #619. † Denotes comics I particularly like. In what issue are you talking about where Bucky’s afraid of heights? Bucky: I… I never said anything… but this… this is how my dad died, Steve. He was demonstrating parachute techniques. He’d done it a hundred times… except that time, his silks never deployed. Never. I know that for a fact… ‘cause I was on the same plane. I watched him fall… ’til he was gone. What if I fall, too? I’m ashamed, I know you need me. I know I’m being a dope. But I’m afraid. Brubaker retconned this a bit, and had Bucky learn about his father’s death with a knock at the door and a lump in his throat. Despite my fondness for this scene, it’s the type of thing continuity can forget, so I wasn’t surprised to see it never come up again. 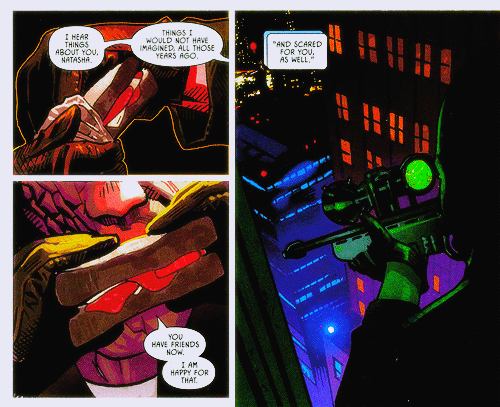 But Bucky’s fear of heights came back in Winter Soldier #3, which is where the panel cyborgcap posted comes from. Natasha: He doesn’t like heights. Bucky: No, I don’t like leaping from 1500 feet without a parachute. Jasper: Well, the jump rig will reorient your position and velocity, so you should land inside on your feet… in theory. Bucky: Are you sure we can’t just ring the doorbell? Bucky belongs to the “la la la I don’t know what you’re talking about” school of emotional problem solving, so for him to admit a fear is an intimate thing. That Natasha knows he doesn’t like heights means something. Posted on November 7, 2013 Tags bucky barnes, questionsLeave a comment on In what issue are you talking about where Bucky’s afraid of heights?